✔ MAP INTEGRATION & SELFIE CONTROLLER - Lost your phone in town, but you're not sure? 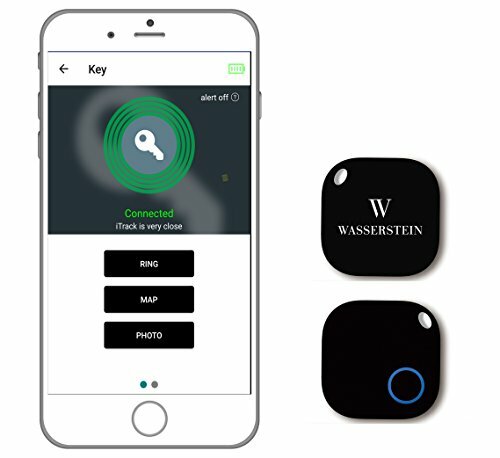 In the App you can track all items that are tagged with a Wasserstein key finder on a map. The button on the key finder can also function as a shutter release for your phone camera. Taking the perfect selfie has never been easier or more convenient. ✔ EASY USE - Fully compatible with iOS devices 8.0 and higher or Android devices 4.3 and above. Simply follow the guided steps in our manual to pair up the Key Finder to your phone. Micropower technology guarantees ultra-long battery life, replacement battery included, along with a handy pick to help pry open the back cover, when battery replacement is necessary. This small compact device is made from polycarbonate plastic making it extremely durable. ✔ WASSERSTEIN SAVINGS - Realize huge savings when you buy our Key finder together with our Handbag Accessories: USB tassel Chargers (ASIN: B01JZQ8MGI, B01JZQ8MR2, B01JZQ8MRC) or our practical car hook hangers (ASIN: B06XBWKNZT) - Use discount code 'HBAGDEAL' at the checkout. ✔ SMART ANTI-LOST - No more playing hide and seek with your valuables. Our Bluetooth Key Finder allows you to tag your frequently misplaced items by using the iTrackEasy App. Simply pair the device to the App and you'll always be able to keep track of all your belongings. To use, select the object you would like to find from the app follow the beeps emitted from the receiver and it will reunite you to your lost object. LED light on the device is helpful in aiding you to find objects in the dark. If you have any questions about this product by Wasserstein, contact us by completing and submitting the form below. If you are looking for a specif part number, please include it with your message.